the zodiac sign of Libra. The vault of heaven is represented by a disc, held up by four women assisted by falcon-headed spirits. Thirty-six spirits or "decans" around the circumference symbolize the 360 days of the Egyptian year. The constellations shown inside the circle include the signs of the zodiac, most of which are represented almost as they are today. 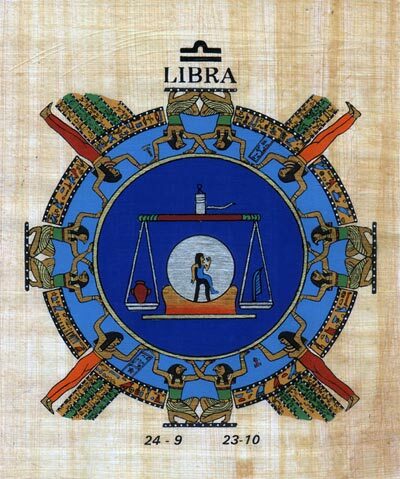 In this papyrus, the zodiac sign of Libra is shown in the center.